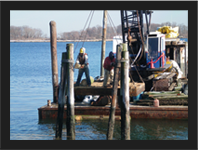 Constructing turnkey marine facilities, from private waterfronts to commercial boardwalks. Concavage offers full service marine construction for the commercial and residential client including waterfront property marina installations and rehabilitations. Our fleet includes crane barges, tugs and specially equipped workboats to suit projects ranging from personal docks to large scale municipal development. To find out more please visit our Services page or give us a call at (914) 934-9612.